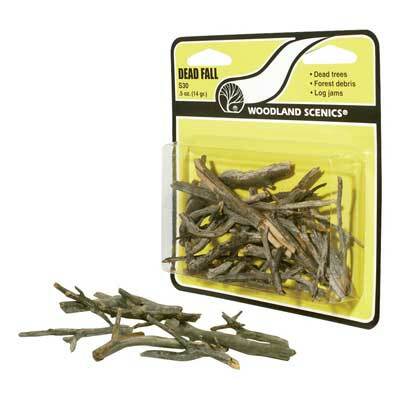 A natural, realistic product used to model fallen or standing dead trees and stumps which has the authentic look of the aged wood. An assortment of wooden pieces which can be used on any scale layout. Pieces feature gnarled branches, splits, and knots- some are smooth with signs of withering. There are forked and curved pieces: all representational of real, decaying wood. Apply with scenic glue. 1/2 oz. package.